Well, It's finally here. 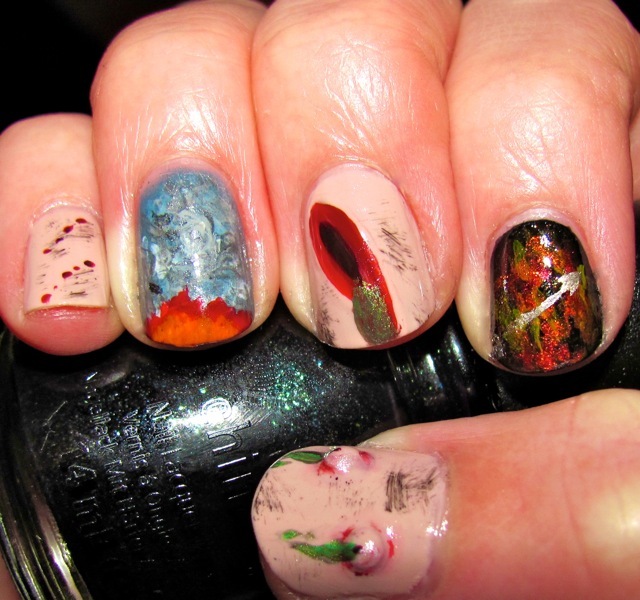 The Hunger Games movie premier and the final installment of my Hunger Games manicure series. The thought process and preparation for this manicure was actually thought of weeks ago and inspired my recent series in the first place. I thought the perfect way to encapsulate the Hunger Games was with the perils and action of the actual games themselves (cuts, burns, scrapes, trackerjacker stings), along with a few key signatures themes of the books themselves. Of course, I had to try to attempt to paint a Mockingjay. I'm definitely no real artist and have sort of self-taught myself painting designs, but I think it turned out as good as I hoped (although I might get some better pictures up, I'm not sure about these...). Enjoy the movie and Happy Hunger Games! My Wounded Flesh nails were done with a base of Zoya Skye, three coats. My Mockingjay & Flaming Arrow nails had a base of China Glaze Smoke And Ashes, three coats. My Smoke Diversion nails were a base of OPI I Have A Herring Problem, three coats. Seche Vite was my top coat. Tracker Jacker Stings: A base coat of Zoya Skye with a gemstone covered in another two layers of Skye. I also used the colors Zoya Tamsen, Orly Au Champagne for shading. 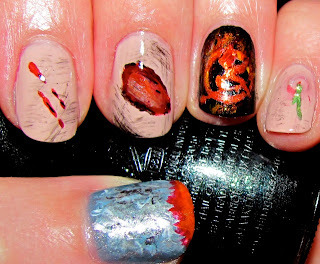 Mockingjay: Using China Glaze Passion with the Bundle Monster plate BM07's peace symbol circle as a base. Passion was also the base for the hand painted Mockingjay with China Glaze Riveting on top. Flames for China Glaze Sun Worshipper, China Glaze Foxy, China Glaze Liquid Leather, OPI A Roll In The Hague, China Glaze Riveting, China Glaze Go Crazy Red, Zoya Tamsen, China Glaze Passion is the arrow color. Smoke: OPI I Have A Herring Problem, China Glaze Electric Beat, Zoya Tao, Zoya Dove, China Glaze White On White, China Glaze Platinum Silver. Fire: Zoya Tamsen, OPI A Roll In The Hague, China Glaze Sun Worshiper. How disgusting, appropriate, and amazing. The oozing pustules are my favorite part. Bravo!